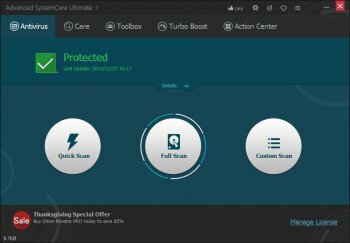 Advanced SystemCare is a comprehensive PC care utility that takes a one-click approach to help protect, repair and optimize your computer. It provides an all-in-one and super convenient solution for PC maintenance and protection. This program is available free of charge. Before you fly off into the Sunset with this Conglomerate of Tools. INFO: There had been 97 downloads of this App when I made this Post. Great program - Using it for years with no problems. Never had a problem booting and if I did I have a boot disc. Speeds up my machine when I run it (every 2 weeks). Unable to decipher what salim74 means & the 'review' is of debatable origin IMHO. I do know that SystemCare does anything but care for your system, if you use it in time you will regret ever installing it as it will mess your registry up, it's not a case of if but simply when. A registry backup made with this program is of no value in a none booting PC. It does have a great looking interface though.